The timing and ease of how medical marijuana policies are adopted vary greatly across the United States — in Hawaii, the first legal dispensaries are preparing to open 16 years after the state passed its law; in Montana, efforts are underway to undo its medical cannabis regulations. But in one pocket of the nation, a medical marijuana industry is quickly being constructed with little fanfare. Puerto Rico, which started drafting its framework in January, could see its first sales under the new program in a matter of months, the general counsel for the U.S. territory’s Department of Health told The Cannabist this week. Considering the timing of approval for cultivation licenses and other pieces falling into place, it’s realistic to think that sales could commence early next year, said Mayra Maldonado, legal adviser to the health department. The health department has received 21 applications thus far — all but one are for cultivation licenses, she said. Officials expect more manufacturing and dispensary applications to come in the following weeks and months, she added. By January 2016, the a regulatory framework had been established. Officials said cannabis could be used in the form of pills, creams, patches and oral drops, the Associated Press reported. Officials laid out other initiatives such as implementing a seed-to-sale inventory tracking system, licensing for doctors and commercial cultivation, and establishing testing protocols. Puerto Rico, following in line with its already strict anti-smoking regulations, will not allow for the smoking of medicinal marijuana. In March 2016, Garcia indicated he wants the territory to go even further and legalize marijuana. During his final public address, Padilla said the legislature should move to legalize cannabis, or at least approve a 2013 bill that would decriminalize marijuana. When drafting Puerto Rico’s policy, regulators cherry-picked the best practices from U.S. states, traveled to Colorado to get a first-hand look, and opened the microphone to members of the public, Maldonado said. “We tried to do the best of the best,” she said. That meant grabbing a dash of Colorado’s three-tiered model for business licensing and the state’s security protocols, a pinch of Nevada’s reciprocity policy and a nip of Oregon and Washington’s laboratory regulations, said Mark Slaugh, chief executive officer of Denver-based iComply LLC. Slaugh’s iComply provides services to companies and governments adopting marijuana regulations, and his firm has been working closely with Maldonado and other Puerto Rico officials in the development of its rules. Slaugh said he was drawn to the cannabis industry and this line of work in part to help address social inequities and what he sees as the systemic oppression of minorities. The Puerto Rico regulations were crafted with residents in mind. Regulators implemented residency requirements similar to those in Colorado — 51 percent of the business ownership needs to be in the hands of a resident who has lived there two years or more. “We wanted to balance the scales … we saw this also as a tremendous opportunity to generate wealth,” he said. Regulations tailored specifically by and for the island include hiring a minimum of two security guards, not allowing the smoking of cannabis by patients, as well as implementing a system to track purchases made by individuals to help prevent “dispensary-hopping,” Slaugh said. The 14 qualifying ailments include conditions such as cancer, HIV/AIDS, Crohn’s, Alzheimer’s, Parkinson’s, Hepatitis C and anxiety (including PTSD), according to Maldonado. Business operators may also benefit from the territory’s tax structure in not having to manage provisions such as 280E, Slaugh said. In terms of the regulations: A dispensary can provide up to a 30-day supply at one point in time, and minors have to receive two doctors’ recommendations and parental approval to receive a patient license. Doctors have to undergo six-hour courses, Maldonado said, adding that the department received more than 50 applications after the first two training sessions. The island skipped a $399 million debt payment due May 2, but the defaults have continued to escalate. Puerto Rico has been struggling with a prolonged recession, with rising unemployment and declining business that has led hundreds of thousands of residents to move to the United States mainland. 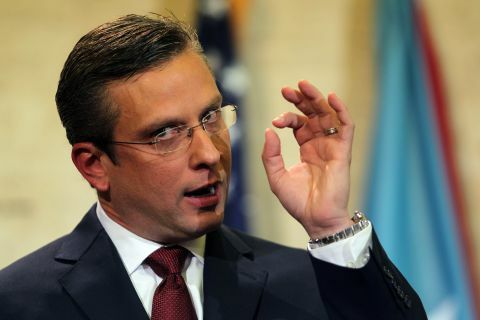 The inclusion of a reciprocity provision — which allows medical marijuana patients from other states to purchase products from Puerto Rico dispensaries — was looked upon as a huge value-add for a country with a strong medical tourism industry, Maldonado said. “I think Puerto Rico is going to be a very large market,” said David Dinenberg, founder and CEO of Los Angeles-based Kind Financial, which is developing a payment platform for businesses in the cannabis industry.